If you are looking for a long term, low maintenance, eco-friendly, solution for your roof consider metal. Metal roofing products cost more than traditional asphalt shingles, but they also last two to three times longer. The upfront cost is two-fold, first in a premium material and second it takes a higher skill set for installation. When considering a re-roof option, know that metal roofs weigh about a third of shingles and can be placed over existing shingles thereby reducing tear-off cost and landfill debris. Most steel manufacturers use a minimum of 25% of recycled content in the fabrication of their panels and even if the home is torn down in the future, a metal roof can be salvaged and recycled. Offering multiple options in style, material and color, metal is an attractive alternative to shingles. Typically, steep-sloped roof styles are interlocking standing seam panels, exposed fastener panels or metal shingles. 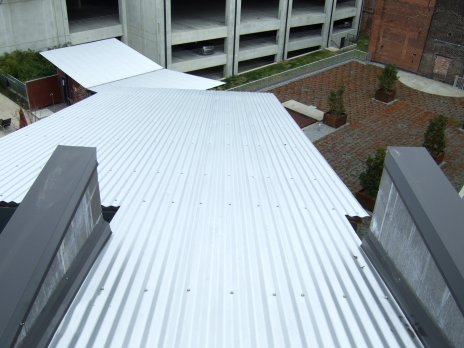 Low slope roofs receive flat lock panels or standing seam panels. Standing-seam panels (above and below right) are long, narrow panels that often run the full length of the roof. These are suitable for both steep-slope or low-slope applications when machine seamed or sealant applied at the seams to ensure water-tightness. Sheet metal panels (above left) offer a wider variety of profiles, sizes and thicknesses but are typically installed with exposed fasteners that may rust over time. Inspections require closely looking at the fasteners since they degrade at a faster rate than the panels. Interlocking metal tiles are an attractive option however, are easily crushed if a technician walks on them. 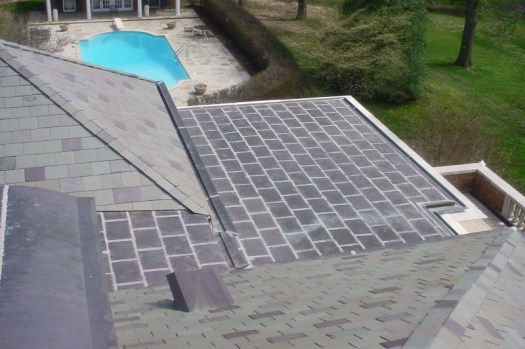 Flat-Lock panels (below left) are ideal for low-sloped roofs because each interlocking panel is soldered creating a monolithic finished surface. 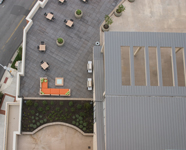 Material options for metal roofs vary from steel to aluminum to copper or Rheinzink. Steel typically is the least expensive with aluminum a step higher and finally copper and Rheinzink are the top of the cost scale. Copper and Rheinzink attract people with their natural colors and copper ages over time turning from bright to green. Color selection on steel and aluminum varies from white to dark and most manufacturers have a selection of “cool colors” that quality for Energy Star solar reflectivity criteria. Colors such as this Colonial Red roof are included even though it is not considered a light color. Solar reflectance measures the amount of solar energy immediately reflected from the surface. Energy not deflected is absorbed by the panels and released after the sun goes down. Cool metal roofing contributes to reducing a building’s annual energy consumption by having a lower surface temperature than dark asphalt roofs. Buildings designed with correct amounts of insulation and ventilation further trims down the heat gain into the attic or living space below the roof. The eco-friendly benefits of metal include longevity, rainwater harvesting, and potential for solar panel attachment. As a testament to the lifespan of a metal roof, this Nashville residence, built in 1931, has the original 5,000-square-foot standing-seam roof that we have coated at least three times. Coatings extend the life of the roof an additional 10-15 years depending on maintenance. Metal is the most commonly used surface to collect rainwater due to reduced algae, mold, moss or pathogens. Steep-sloped metal roofs have a slicker surface making it harder for dust and debris to remain on the surface. This makes annual cleaning unnecessary. Metal roofs have a “collection efficiency” of about 95% while asphalt roofs average 85%. Copper roofs do present a concern if you are intending to drink the harvested water, test to be sure that the copper levels are not too high. All rainwater should be filtered and possibly tested for lead and other contaminants prior to use as drinking water. For additional information on rainwater harvesting check out Brad Lancaster’s site. Solar panels or photovoltaics (PV) convert sunlight to electricity. Lightweight and flexible, amorphous silicon PV systems can be produced in a thin film able to be adhered between the ribs of standing-seam roofs. Integrating into the design of the building while silently transferring energy without the boxy look traditional solar panels. Serving as both roofing and energy provider can offer savings in electricity, reduction of fossil fuel use while adding architectural interest to the building. Recapping, having a metal roof offers many benefits to homeowners and building owners: Longevity, solar reflectivity and PV conversion, rainwater collection, aesthetic, style and material options to fit the building.